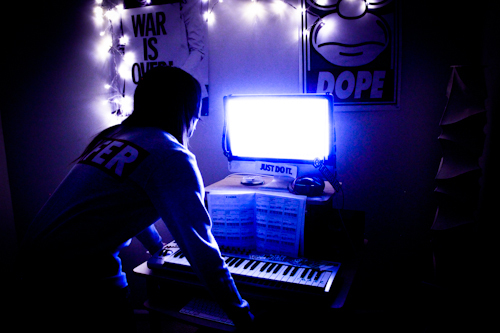 TRAKGIRL: Meet Female Producer Next Up In The Music Industry! Today, Product of Society brings you a young lady who is not only changing the music industry, but paving a way for future aspiring female producers. Shakari “TRAKGIRL” Boles has written and produced for numerous popular artists. In fact, her innovative style of producing even grabbed the attention of the legendary music producer, Timbaland. 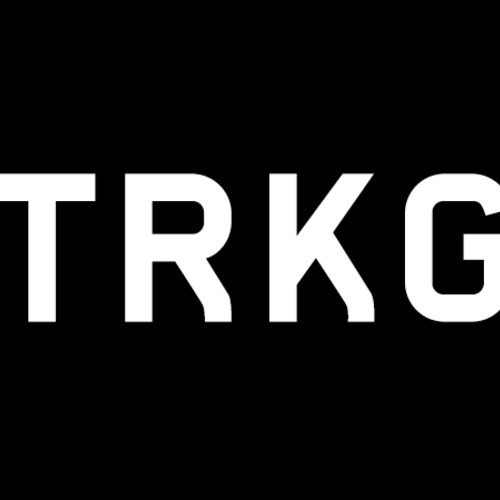 Check out the Q&A below to see how TRAKGIRL began her career and why she will be one of the most influential producers in the music industry! For starters, where are you from and what university did you attend? I’m originally from West Palm Beach, Florida. I earned a degree from Hampton University in Marketing. There aren’t a lot of female producers in the music industry, what inspired you to write and produce? I’ve always been surrounded by music. My family has a strong musical background. My mother plays several different instruments from a classical standpoint. My grandfather sang in a quartet back in the day and a few of my uncles played the piano. So it safe to say, I definitely gained my musical inspiration from my family. I first started creating music when I was 15 – I saved up my chore allowance and purchased my first beat machine. It was an Akai MPD 16 to go along with my small, red gateway laptop equipped with the program Fruityloops (Talk about “Started”..lol)! Since then, I just practiced and surrounded myself with producers who were better than me; I just..LEARNED! I’ve gained some awesome mentors, stayed focused, kept perfecting my craft, and always listened to different types of music. Being eclectic is essential and refreshing. Word, that’s pretty’s cool! How has it been getting into this rigid industry, do people take girl producers seriously; and if not why should they? Getting into the music industry is definitely tough, but once you are in it, you have to remain consistent and just continue to make GOOD music. Music has no limitations so I try to steer away from what’s “trendy”. I think people are slowly taking us [women producer] seriously..there’s not too many female producers really getting into the industry, but the year of the female producers is coming..very soon! Trust me. I think the industry should definitely take us seriously because at the end of the day, producing should be about talent and merit. Regardless, it’s all about the musical content at the end of the day. Who are some of the people you’ve been able to produce for so far? I’ve produced for Tiffany Evans, Mansions On The Moon, Omarion, Luke James, Chip the ripper (King Chip) just to name a few. Lol, that’s not a bad list, not bad at all. Where do you see yourself 5 years from now? 5 years from now, I see myself being a top producer, not solely a top female producer. I want to be present at every award show with charting records. My work ethic won’t change, however, I still plan on working hard like I’m a newbie. In the music world, connections are imperative. 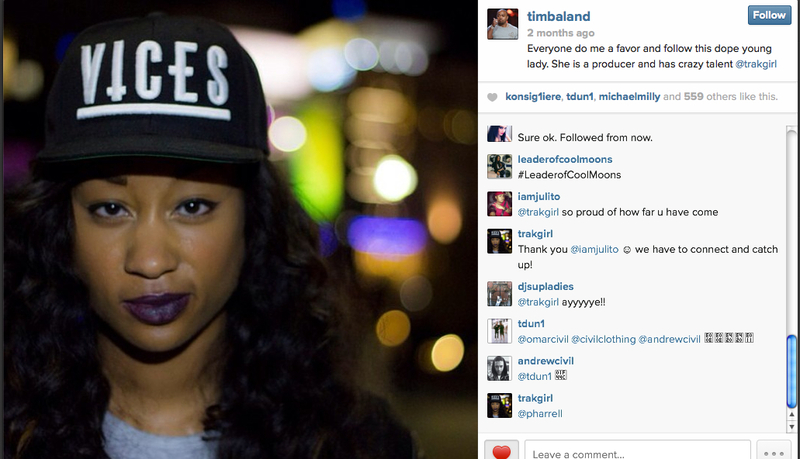 So how did you feel when Timbaland shouted you out on Instagram? It was very cool! I look up to Timbaland, so for him to co-sign me is definitely a good feeling. He’s one of mentors so I’m blessed and thankful. Yeah, I agree that definitely was a power move to have a legendary producer co-sign your talent! Product of Society would like to thank you for your time and wisdom about being a producer and song writer in the music industry. Before you go, are there any words of wisdom for other aspiring producers? To keep striving to become better at your craft and build your own sound. Have patience and have faith!